Most of the time we prefer to meet at your location, however you are welcome to visit our showroom, we are located near the intersection of Hudson Ave and US 19 in Hudson Fl., by appointment only. Dex Imaging is a LOCAL family owned Copier, Printer and Document Solutions company. We are the Nation's largest Independent Konica Minolta and Kyocera dealership. Our corporate offices are located in Tampa Florida. We have 23 offices throughout the state of Florida. We do business the old fashion way. We go door to door and earn your business by providing great products and services at a reasonable price. 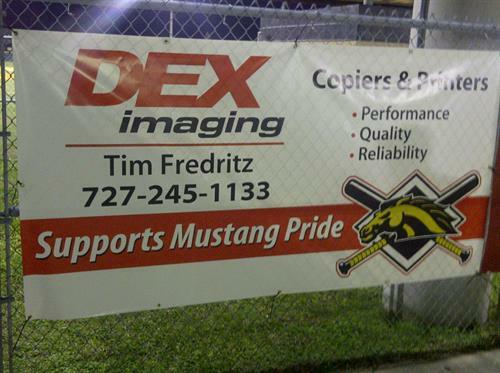 Dex investing in the local community, Mitchell High School Baseball Sponsor.